I just got a smart phone, thank you, and am finding my way around Twitter, Facebook and other social media that I use. Watching the Oscars was the first time I tried my had at Tweeting an event while it was happening. I received tweets from Toby, Jen Bonet, Liz Straus and other tweety-birds. My phone-typing skills are still not great so I want to take a moment to give you my take, as a filmmaker, on the Oscars. First of all, I love award shows. I sit and put on my best Joan Rivers dis of the fashions, listen to inside gossip from other friends in the entertainment end of the biz, and generally indulge this guilty pleasure. For the most part, the Oscars go according to plan. It’s a bit of a popularity contest with studios and distributors taking out huge ads in the trades to promote their film, their star, and the importance of what they have done. There were really no unexpected winners this year. There was some talk of Melissa Leo having blown it by taking out some ads on her own. Hey, if you can’t toot your own horn, who will do it for you. Not everyone has Julia Roberts in their corner (Javier Bardem). I worked with Melissa on Frozen River and she is one of the most focused and hard working people I’ve ever been associated with. After all the years she has put into her craft and the generosity she has shown to Independent and unknown filmmakers, I was happy to see her get her dues. All the big categories went pretty much according to form. We got to see some cool special effects during the show. I thought Anne Hathaway did a fairly good job. Not sure why she need to keep changing her gowns. She had good energy and seemed to be really enjoying herself (and she can sing). James Franco, on the other hand, seemed really uncomfortable out there. Maybe he should go back to Yale and practice his “stage” presence. Billy Crystal came out and showed us how to do it…as did Bob Hope. All this latest hosting duo showed me was that actors really need to have their lines written for them (preferably by good writers). And now for the categories near and dear to my heart…Documentary Short and Feature Length Films. What an amazing collection of great films. If you have the opportunity to see any of them, I can tell you that you are in for some amazing experiences. Unfortunately, HBO is just about the only place to see documentary films these days. On occasion a film will generate a lot of buzz and get a theatrical release, but the short documentary is often overlooked. That is unfortunate. So here is a list of the Documentary films from this year’s Oscar Nominations. I hope you have the chance to find them on the internet, because that’s just about the only place you’re likely to see them. 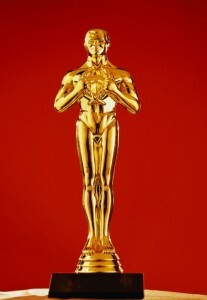 Tell me what you did or did not like about the Oscar show. Debra, Thanks for the list of documentaries. I will seek them out and watch and let you know what I think. I have to admit the Oscars are a defnite guilty pleasure. I even bought my new HD TV the day of last year’s awards, my 15 year old TV was definitely less than stellar. I also thought Anne Hathaway was good and really belted out her little song. I always like the gowns and can’t resist making fun of the stupid commentary on the Red Carpet. And I’m glad it’s over for another year.